It was like a reality TV meet up – Hell’s Kitchen and TLC Extreme Couponing! Come along and let me share our night out. We celebrated without guilt! On our anniversary we had an amazing meal with Gordon Ramsay by the way of Paris to his new restaurant Steak! Mr. Cameraman and I celebrated our 23rd wedding anniversary. Watch the video for the cool red lights on the ceiling – it’s a resemblance of Gordon Ramsay’s wild hand movements! Mr. Cameraman is to thank for all the fun. He made the plans, reservations, checked out the menu and selected great wine! Come along and let me share our night out. Gordon Ramsay’s Steak is located in the Paris hotel and I tell you it was the best steak EVER! We have traveled all over the world and dined in incredible places but this was a melt-in-your-mouth experience from beginning to end. We had a special ravioli appetizer and Caesar salad, Porterhouse steak for 2, shared a loaded baked potato with pancetta and Gouda bechamel sauce. Dinner was finished off with Gordon Ramsay’s award winning Sticky Toffee Pudding and Brown Butter Ice Cream. Even after sharing all our food we were just at the point of feeling like no-more-food but not stuffed. Normally it seems when we take the time to really enjoy an expensive meal we leave a bit hungry, but not here! It’s perfect. When in Vegas I highly recommend heading to Paris through the English Channel Tunnel to get to Gordon Ramsay’s Steak restaurant. When you walk into the restaurant the “tunnel” represents the English Channel Tunnel. Oh, one thing I really liked was we went early, 5pm. I would always pick that time again. It wasn’t crowded, we were ready to eat & didn’t eat too late going to bed full. We had time to be back home and give the kids love before they drifted off to sleep! Doesn’t this seem off from our frugal and Almost Free Livin’ lifestyle? Actually it is because of that life style that we celebrated without guilt! We were able to enjoy every second of our meal and night, paid cash and left feeling guilt free from the cost. I want to encourage you that while saving and through the struggles applying new strategies it will pay off and feel good! But along the savings-way it’s imperative to find something you want to splurge on! Splurge does not necessarily mean costly. It may be as simple as going to Starbucks & enjoying every sip of your special coffee or buying 1 great new pair of jeans (not 4)! It is a matter of rewarding yourself on occasion with something you do not need but simply want. Here are some Vegas deals that you can splurge on with a savings too!! Sign up and start getting the deals & plan! We saw the old Blue Man Group performance but they now have a new show. 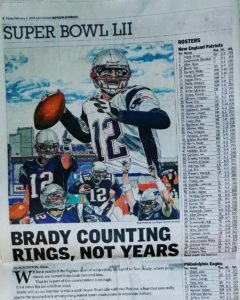 We are planning to see the new one (discounted of course) and take the twins since 8 yrs old is just around the corner! There is a locals buy 2 get 1 free deal. So check out All new Blue Man Group shows specials in Vegas, New York, Boston and more! Reward Yourself during your savings!! It will make the efforts worth it! Vegas is family friendly with some pretty cool places. One is Gilcrease Orchards. We have been going to Gilcrease Orchards since the twins were 1 years old. I have picked apples most seasons and made easy homemade applesauce (I’ll share that recipe soon). As I shared in the Week In Review we went looking for pumpkins at the pumpkin patch, but there is SO much more to do at Gilcrease Orchards. 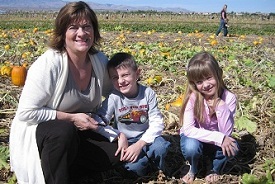 It’s a Pick-your-own farm in Vegas and a great place to go for some very frugal fun. 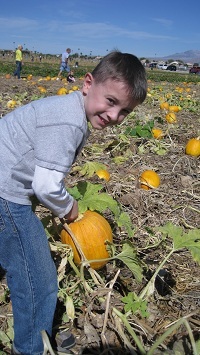 Pumpkin Patch – open til the end of October. It is a few dollars a car to drive in (we paid $3) and the produce seems to be priced mostly at $2 a pound. For fresh of the plant vegetables and fruit makes this a crazy good price. Fall hours: Open Tuesdays and Thursdays from 7:00 am to noon. Saturdays from 7:00 am to 2:00 pm and Sundays from 8:00 am to 2:00 pm. Have you been to Gilcrease Orchards before? 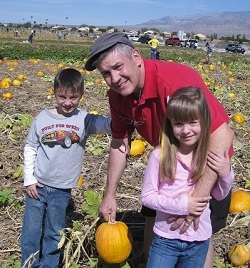 A family friendly free kids activity in Vegas, it is very family friendly! Come to Town Square! It is beautiful, not only for the shopping and eating, but the kids park is beautiful. 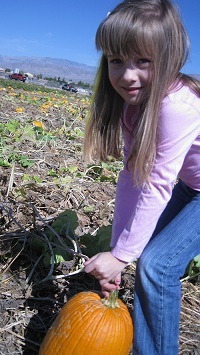 It is a Vegas free kids activity that will keep you busy for an afternoon, easily. Since the twins were little we have gone to Town Square to play on the fun structures, the water feature in the summer keeps the kids busy. There will be free story hours. Plus the grass is soft and it is lined with a stream and a bridge and fountains! They now have a cute train you can ride on and it will take you around Town Square too! In the winter there are some cool things — like they make SNOW!! 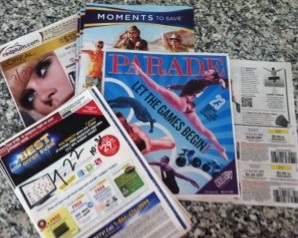 I am always on the look out for free kids activities in Vegas and I will share when I find them. Plus, right now Kids Eat Free at the new Ranch House restaurant! I will get some more footage during the day so you can see exactly how amazing it is, but in the meantime – go visit Town Square and plan to spend the afternoon. It’s free family fun in Vegas, so take advantage of it!! In case you missed this, I want to remind you of the Free Family Film Festival sponsored by Rave Cinemas, going until Aug 20th, twice a week, doors open at 9:30 AM and a FREE movie (G or PG) starts at 10:00 AM. 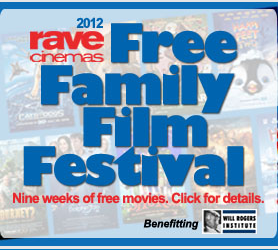 Click to see if the Free Family Film Festival is in your city. And print the coupon for a free ICEE upgrade when you purchase a kids combo at the Festival! Free family movies in Las Vegas every Monday starting June 25th. Never miss a great deal, freebie or update! Subscribe to the eNewsletter and like the Tip Resource facebook page.